Unrest encumbers the nation. Now more than ever, this is undeniable. Thousands are dead because of the war on drugs. An uncertain number is lifeless and hundred-thousands displaced because of the Marawi siege. These only add to the many conflicts – daily and otherwise – already besetting the nation. Mindanao is among the places where all these struggles intersect. Longtime conflicts with rebel and terrorist groups have plagued the Southern Philippines. The government has historically invested little on development efforts in the island group we call “land of promise”; some provinces are among the poorest in the nation. The lack of focus on Mindanao has resulted in many unfortunate situations, from destructive mining and plantation farming, development aggression by police, military and paramilitary groups most especially felt by the Lumad, to even religious extremism. Some places still have none of the most basic services, from health centers and schools to irrigation and electricity. Many are not equipped for geohazards and hydrometeorological disasters. The dire circumstances remind us, the Youth of the Iglesia Filipina Independiente, that unpeace does not spare the young. The supposedly nurturing experience of youth is disrupted whenever people have to flee their homes – and have to live in temporary residences or evacuation centers, relying on relief goods for sustenance. Potentials and dreams go unfulfilled with the death of young people because of the overwhelming violence and insensitivity. The YIFI is an organization that comes from a Church “for the people,” that springs from the idealism and vibrancy of the young, that believes young age does not make one a minor character in nation-building. We applaud every single person, especially the young ones, who are in Metro Manila now for the Lakbayan ng Pambansang Minorya 2017. It takes courage, perseverance and passion to outlive, comprehend and now battle the conditions that oppress. You deserve our respect, our ears, our minds, our might. Your voices carry legitimate experiences of injustice, which we now commit to echo. We would, therefore, like to remind the government to stop undermining the importance of human rights. Without applying human rights universally on our land, we run the risk of violence and bloodlust. We believe many of the questionable deaths now are a result of the long-standing impunity intensified by the new rhetoric that tries to bend the meaning of human rights. We reiterate that human rights are the state forces’ violation of the Constitutional rights of individuals. They are our protection against what history tells us are the tendencies of the police and military to train their guns on people whom courts have yet to prove guilty. We also remind the leaders of the country that we are a nation of peoples. We are many groups. The interest of the country must be determined with special attention on the diversity of the land. The government must keep on asking the minorities and the most vulnerable in society what they need whenever deciding for them. It must make sure that “development” is consultative, and not just with corporations and oligarchs and technocrats, but also and most importantly with the residents. We are, lest we forget, a democracy. The core of this system is the people, no matter how low their standing in society may be. We ask for this as projects are imposed on the indigenous peoples and as the government heralds the rebuilding of Marawi, the country’s only Islamic City. The Lumad say martial law has only intensified militarization and the violence at them. Armed men are now more confident in intruding into villages, surveilling private people and planting insecurity. They want to quash the collective movement of the people for their self-determination, at the expense of their right to organize. Martial law has given the forces more teeth, and a better excuse, to serve private and other anti-people interests. Martial law has intensified human rights violations all over Mindanao. Therefore, we ask with the most affected in Mindanao for the lifting of martial law. The problem seems to be that the administration equates silence with peace. There is a deliberate effort to make people conform. We see these through fake news and propaganda, pressures and maneuverings to convert or undermine dissenters, violent language and threats. We see this through the discrediting of the testimonies of the people. The President has threatened to bomb Lumad schools, which were only the indigenous peoples’ response to the government’s ineptitude in the first place. He has threatened to blanket the country in martial law if he sees reason amid the events on Sept. 21. Threats – and the actualization – of harm and death come easily to those who do not fear him. But, silence is not peace. Shutting people up, even for good, does not solve the problem. 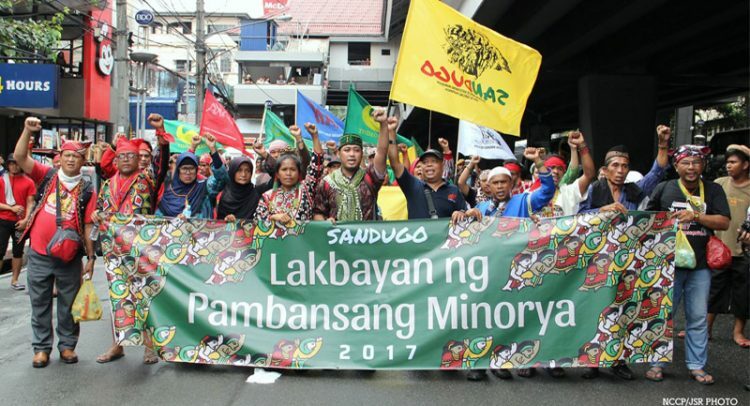 Many Lumad and Maranao, for example, claim to be emboldened by the destruction and the deaths of their kin and advocates. They swear to fight on until they get the change they want. Their example teaches us that as long as people go through the same experiences of hardship, the sentiment simmers and then resurfaces. Therefore, the problems must be addressed from the source: the tragedies of poverty and landlessness on the ground only complicated by the prejudice and incapability on the part of the government. The YIFI challenges Christians. Jesus has taught believers that love must not only be upward. The second part of the Golden Rule is to love the neighbor – especially the people who are in need and vulnerable – as ourselves. If we keep praying to God for peace without realizing that we were told to love one another, for the reform of other people if we are not agents of peace ourselves, what good are we? To the national minorities and the young people who fight for their rights, padayon! Stop the slaughter! End impunity!